Pamplin Media Group - WL is starting a new art commission. What happened to the old one? WL is starting a new art commission. What happened to the old one? As West Linn Parks and Recreation Director Ken Worcester remembers it, the City's original arts commission wasn't formally disbanded. It didn't drown in a sea of controversy, and the need for such a commission didn't necessarily disappear. "They just quit meeting," Worcester said. Now, years later, the City is working to create a new Arts and Culture Commission. The commission will be a formal citizen advisory group with seven members, and its primary purpose will be providing input to the City Council on public art projects. In 2011, after the original art commission had disappeared, the City created a West Linn Percent for Art policy requiring that a portion of funding for public capital projects be spent on public art. 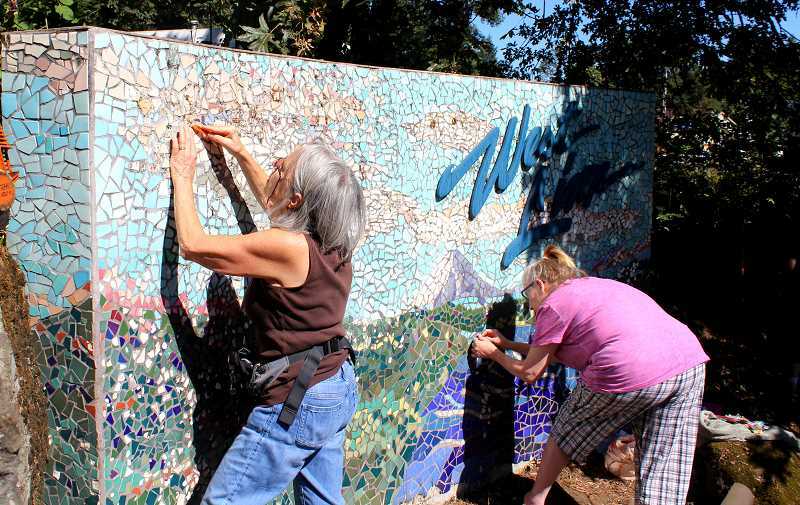 Since then, the City has relied on the Clackamas County Arts Alliance for feedback on public art projects, and these monies have has provided funding for efforts like the Grindstone sculpture at Willamette Park and the map of West Linn at the new police station. Moving forward, the percent for art policy will come back into play as West Linn plans how to spend $20 million from a general obligation (GO) bond that voters approved in May. "This new committee will have the opportunity to advise the council on how to integrate arts and culture into our community," the City Council wrote in a recent op-ed. "The new waterfront plan is just one of the upcoming projects that an Arts and Culture perspective could augment. Many citizens have imagined an esplanade by the river where concerts and other cultural events could be held. Imagine sitting by the river and listening to music, poetry or drama productions during the weekend or in the evening." The City expects to appoint members to the new commission Jan. 14, 2019. And according to West Linn Library Director Doug Erickson, who will serve as staff liaison to the commission, the board's duties will likely extend beyond evaluating public art projects. "I imagine that this commission will not only be working on public art installations, but also community-led cultural events including lectures, concerts and other forms of art that would benefit the citizens of our community," Erickson said. Worcester recalled that the original art commission, which was created in 1988, had a slightly different focus. "They created this arts festival, it used to be at Mary S. Young Park, and they worked pretty hard on that," Worcester said. "Probably the biggest challenge was that the City didn't have any money to go towards public art." Of course, there were other pitfalls that Worcester hoped would be avoided this time around. "A lot of it had to do with (the fact that) the people on the committee were also the ones who were trying to sell their art," Worcester said. "I think we need to be more careful with putting artists on the committee unless it's clear that they understand they're not able to use the committee position to sell their art. That's something I don't think we did a very good job of last time." Worcester said in one instance, a member of the committee asked to access the City's recycling center so they could get materials for a project. "So he could basically kind of clean the materials for free, and build art to in turn sell," Worcester said. "That's a little self-serving." As the city's art community continues to grow, the City's hope is to attract a broad array of candidates for the committee. Local fused glass artist Mitzi Kugler, for her part, was happy to hear about the new commission and said she'd be interested in getting involved. "We have some wonderful artists in our community," Kugler said.